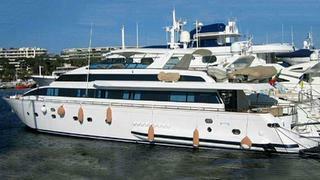 The 30 metre motor yacht Miss Candy has been listed for sale by Gaspard Yachts. Built in GRP by Italian yard Versilcraft to RINA class, she was delivered in 1990 with refits in 2008 and 2014. A stylish interior by Antonio Maggini accommodates eight guests in four cabins consisting of a master suite, VIP suite and two twins, all with en suite bathroom facilities. A spacious saloon offers an entertainment centre, bar and fridge while the separate dining room has warm, wooden paneling throughout. A huge flybridge has a grill, bar and ice maker, and is capable of accommodating as many as 24 guests for al fresco entertaining. Twin 2000hp Deutz engines give her a cruising speed of 20 knots, topping out at 25 knots. Miss Candy is listed for sale asking €1,190,000 with VAT paid.